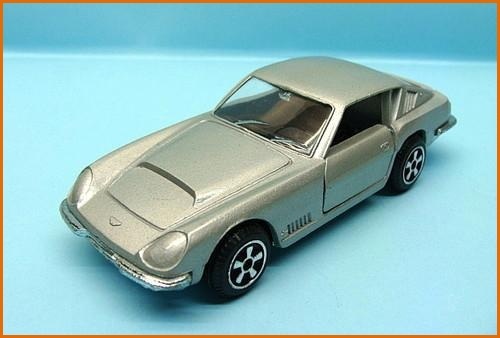 Production of toy cars by the Milan based company Politoys began in the early 1960’s. 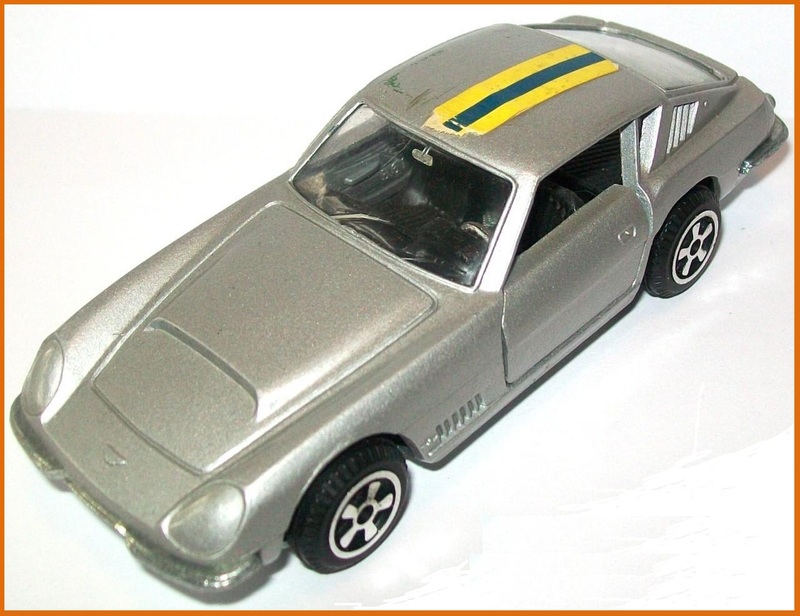 The first models produced on a scale of 1/41 were made of plastic but production was switched to metal in 1965. 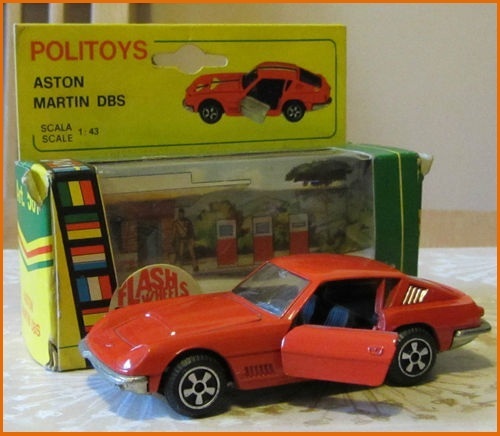 In 1970, the company changed its name to Polistil srl, after a British rival company chose the name Palitoy in a bid to counter Politoy’s growing international success. 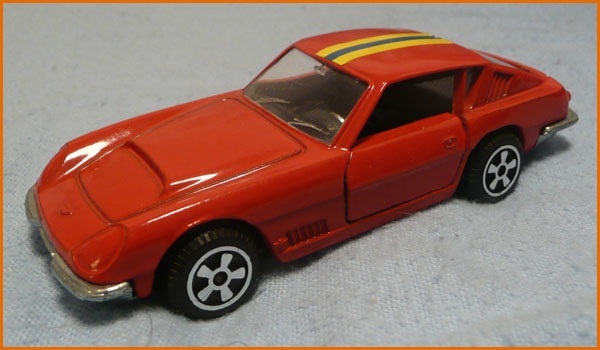 The different models available at the time were on scales of 1/43 and 1/25 and from 1967 of 1/66 trading under the brand name of Penny as a rival to both Matchbox and Majorette. 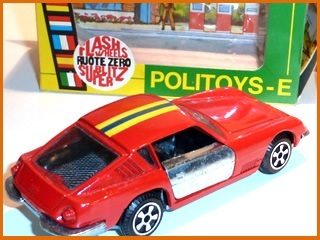 Then in a bid to outdo Solido which was the first manufacturer to equip its different miniatures with a variety of wheels, Politoys were subsequently all made with opening doors, bonnets, boots and movable seats. 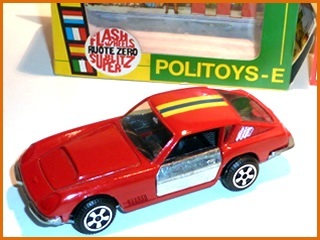 « Politoys Export » produced between 1968 and 1969 was a less expensive version of the « M Series » due to fewer opening parts (a maximum of one or two). 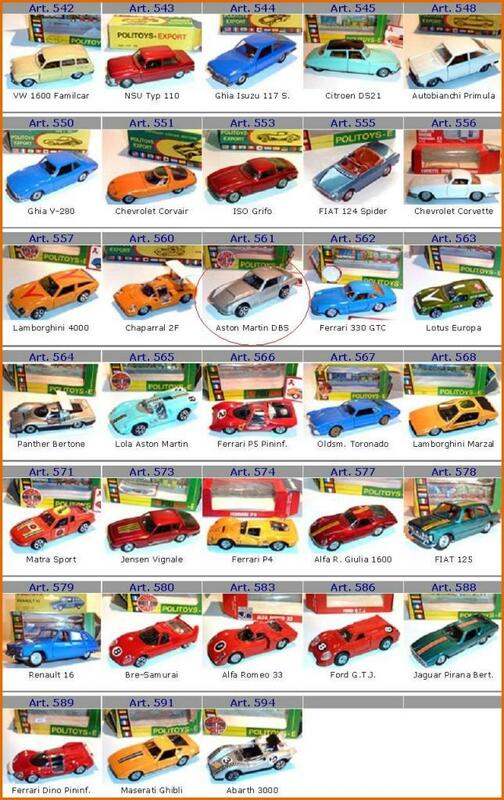 They allowed the company to lower the cost price and to produce 33 different models (see below) ranging from the family saloon to the sports car. 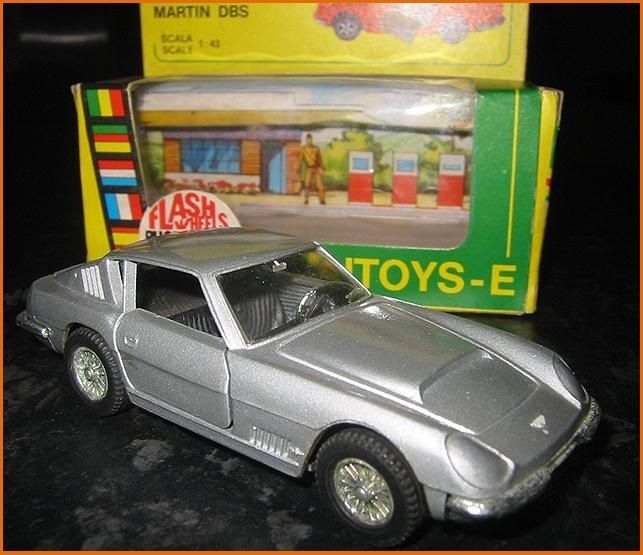 In 1969 as part of this collection Politoys commercialised the « Aston Martin DBS Touring », which it later renamed the DBSC. 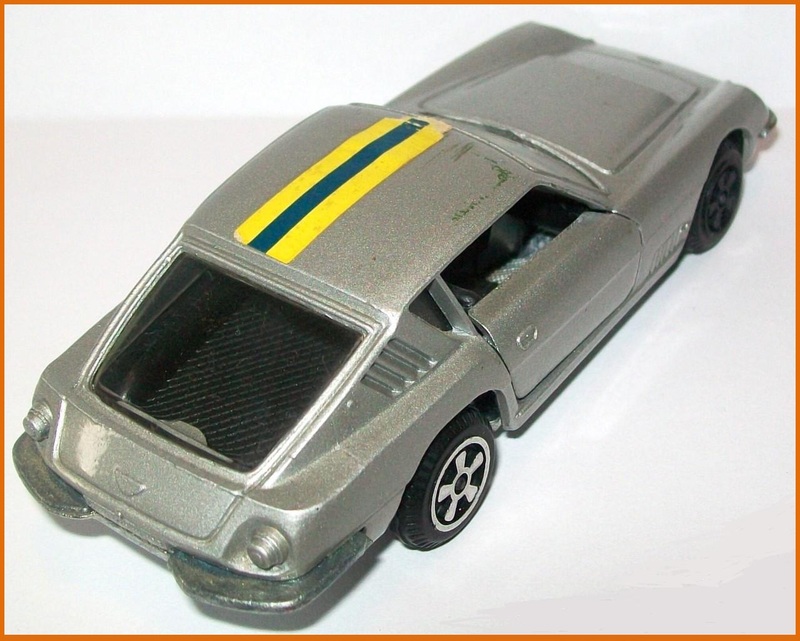 Listed as reference n°561 and produced to a scale of 1/43, the « Politoys Export » Aston Martin DBS Touring was only available in left hand drive form, and was based on Touring’s famous MP/226/2/L prototype. Both passenger doors opened and closed and the cars were available in two colours, either metallic grey or bright red. 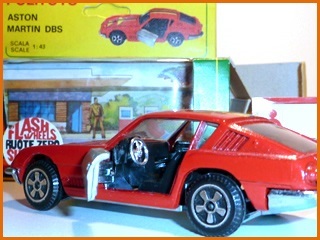 A variation of the latter was also available with chrome doors. The colour choices were original, if one considers that Touring only ever built two DBSC prototypes, a left hand drive car in « Black Cherry » and a right hand drive vehicle in « Dubonnet Rosso ». It is almost certain that the chromed doors were never part of either Touring or Aston Martin’s plans and no known documents from either Touring or Aston Martin exists mentioning such a project.